Where is and Who has Consciousness? This is an updated version of an old article of mine. The experiment was so interesting that I thought it would be good to give it some attention. Have you ever wondered where consciousness is? Is it inside your head, outside of your head? Is it limited to human beings? To sentient beings? or is it something else altogether? I could have easily entitled this the chicken and the robot and you shall soon see why. A French biologist by the name of Péoc’h came up with a clever piece of research. What he did was construct a simple robot with a random number generator determining its movements forwards, backwards and sideways. Just to be clear the robot had no artificial intelligence, special computer chips etc, just a very basic inanimate object capable of moving in directions which were determined randomly. Now things get a bit more interesting. What he did next was have chicks imprint on the robot in order to establish an emotional bond. A very simplified way of understanding imprinting is that some animals will bond with the first thing they see and act and behave like it was its mother. That is a very simplified explanation and if you are not familiar with what the term imprinting and want a better explanation of it I suggest you look it up. The odds of this occurring by chance were a million to one. Not only was it statistically significant but the experiment was later repeated by other researchers with similar findings. Before people jump up and down and say “see love is the answer” a variation of the experiment was conducted with fear as the primary motivator and results were similar. Yes, that is right fear! As long as there was some type of connection between the robot and the newly hatched chicks the emotional state did not seem to matter. One of the findings seems to be that emotional connection breeds a form of consciousness and awareness. The research and other similar studies have some interesting implications. Since a chick’s brain is relatively simply in structure compared to a human being this precludes thought as being the primary mechanism for exerting influence. Another way of saying it is that a chicken’s brain structure does not include the capacity for thought in the same way that humans have. If the brain is involved at all it has to be something more basic and instinctual and primal in nature than our capacity to think. Other research would suggest that the brain is not involved in these sorts of action at distance phenomena. For example, certain types of music are conducive to plant growth and since neither music nor plants have any brain structure then we have to question how are these types of transmissions occurring? The second interesting thing that jumps to mind is what about the robot. Technically the robot is a rock… Well a transmuted rock to be a bit more precise; transmuted into metal and moving parts. Its nature is inanimate and non-sentient at least by our normal understanding of sentience. Physically the robot should only be able to move in a random pattern. Yet when the little day old chickens bonded with the robot, the robot behaved radically differently. There has to be something amenable to change on the robot’s side as well for it to be affected. You follow the logic here? 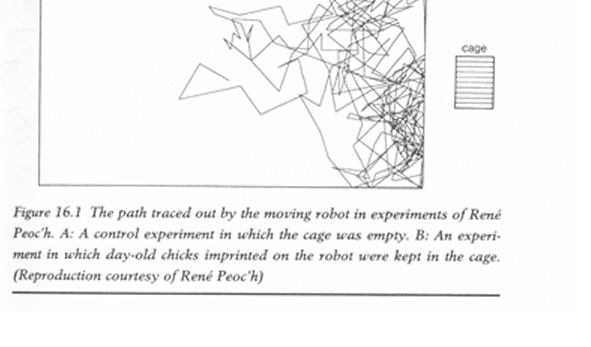 Consider the same experiment done with people instead of chicks and a robot. One influences the other via some form of transmission. But the other is a receiver of that transmission. It has to have the capacity to receive, just as the other has to have the capacity to send. It is reasonably easy to conceptualize this when its two human beings interacting. It is much harder for our minds to apply this same principle between the animate and inanimate. After all where is the robot’s mind for there to be a transmission? But that is the beauty of these sorts of experiments. They do not provide definitive answers, yet they ask us to question our most basic premises. Where is consciousness really? It does not seem to be limited or bound to the human brain, so where is it? Or alternatively who has it?